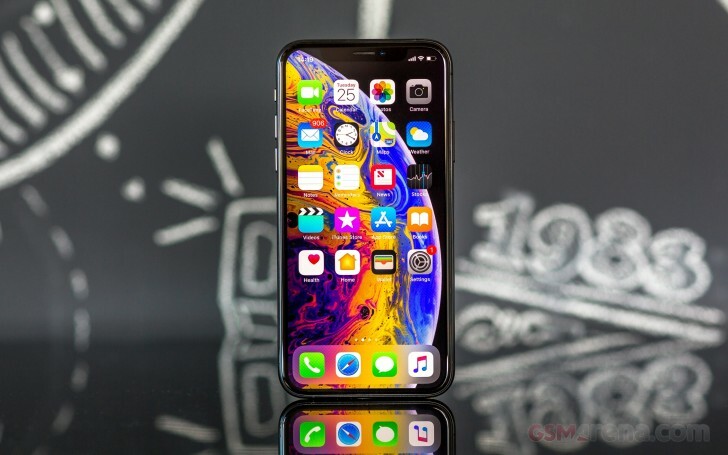 The Apple iPhone XS has the same notched display, which premiered for the first time on the iPhone X and became the spark of the notched revolution. It's a 5.8" AMOLED screen with HDR video support and 1125 x 2436px resolution. The pixel density is 458ppi - pretty flagship levels. Apple's Samsung-made AMOLED screen has HDR video support (HDR 10 and Dolby Vision) and is capable of the proprietary True Tone adjustments. That's an automatic white balance correction enabled by a six-channel ambient light sensor. The True Tone algorithm will correct the white balance according to the ambient light making the whites and grays rendition more accurate. That's completely separate from the blue-light filter called Night Shift. Apple promises a maximum brightness of 625 nits, and 1,000,000:1 contrast ratio. We measured 660 nits of brightness with the slider at the farthest right and True Tone turned off, and about 650 nits with True Tone enabled. This is even more than promised, and it's among the brightest OLED screens you can get today. The Apple iPhone XS, just like the iPhone X, aced our sunlight legibility test and posted the best contrast ratio we've measured to date beating all other phones including all Samsung phones with AMOLED screens. The iPhone XS color accuracy is excellent - we measured an average DeltaE of 1.8 and a maximum deviation of 3. Few phones are as good or better than this, and most of them are in Samsung's ballpark. But the amazing thing is that the display gets to keep such a level of accuracy even when you start lowering the brightness all the way down to 1.8 nits. The iPhone XS is powered by a Li-Ion 2,658 mAh battery - about the same capacity as the iPhone X and 8 Plus. It's a one-piece L-shaped battery, an improvement over the iPhone X's two-piece cell. The Low-Power mode, which you can enable manually, should prolong your iPhone XS battery life once the charge drops below 20%. The iPhone XS ships with the underpowered and outdated 5V/1A wall charger which will replenish only 22% of a dead battery in a 30-min charging session. We also tested the iPhone XS on a Qi-compatible Samsung wireless fast charger - it recharged 20% in 30 mins. The phone supports fast charging through USB-C power delivery, you just need to buy the proper cable (USB-C-to-Lightning, $25), and use a compatible charger from a MacBook, Pixel 2, or even a USB-C port on a Mac or PC. This way you will be able to charge north of 55% of an empty battery in half an hour. You bet we did our usual battery tests and the iPhone XS posted balanced scores across the board - it can do about 14 hours of 3G calls, 10 hours of web browsing on a single charge, or you can watch videos for about 11 hours - about the same as on the iPhone X. The standby endurance also turned out above average and thus the average endurance rating of 72 hours isn't a surprise. Our endurance rating denotes how long a single battery charge will last you if you use the Apple iPhone XS for an hour each of telephony, web browsing, and video playback daily. We've established this usage pattern so our battery results are comparable across devices in the most common day-to-day tasks. The battery testing procedure is described in detail in case you're interested in the nitty-gritties. You can also check out our complete battery test table, where you can see how all of the smartphones we've tested will compare under your own typical use. Update, Oct. 4. Numerous users have reported for charging issues with the iPhone XS and XS Max. Apparently some iPhones won't start charging when the Lightning cable is connected - in some cases a tap on the screen was needed to wake up the phone and start charging, others required an unplug-and-plug-back-in type of procedure. We did try ourselves with the units we have at the office, but for better or worse ours charge just fine, both with the bundled charger and with the 29-watt Power Delivery fast charger. We learnt that this happens when the phone wasn't used for at least an hour. So, we left our XS Max for an hour and then we plugged it in a knock-off charger and cable. Surprise, surprise - it didn't charge. It began to work only when we woke up the phone, removed the cable, flipped it, and then plugged it back in. We repeated the with the original charger - after an hour and we found no such problems. Finally, we used another knock-off charger and it still worked hassle-free. We can't be certain if the knock-off chargers are responsible for the ChargeGate fiasco, but we know how you can fix it. Sure, iOS 12.1 update will squash this bug, if it's a bug, but you can get rid of it today. Just go to Settings -> Face ID and enable USB Accessories option. The reason why the phones won't charge is the additional security that fires after 60 minutes of inactivity and disables the recognition of all USB accessories except the chargers. But some units don't even recognize the chargers either because they are knock-offs or because of some software-related issues with the USB controllers in some units. Now you know where the problem lies, and you can easily fix it. But the jury is still out on whether third-party cables and/or chargers are responsible for the issue, or Apple screwed up with the USB drivers. The iPhone XS has two speakers for stereo audio playback, just like the iPhone X and the iPhone 8 series. But the front one, which is also the earpiece, has been improved. On the iPhone XS it is much louder, almost as the bottom one, and it's not just there to make the stereo effect but be of real enjoyment. The earpiece speaker on the previous iPhones was good, but not impressive as it was weaker than the main one. Music playback was great though, especially on the X, but you could feel the difference in loudness as it is the case with other devices that use the same technique - like the Huawei P20 Pro. Apple has now put a proper speaker behind that earpiece grille, and it is loud, almost as loud as the other one and playing music sounds great for a smartphone. The sound is richer, and the bass is deeper, and after playing multiple songs, videos, and games, we feel the iPhone XS has one of the best speaker outputs we've experienced in a smartphone. It may not have a class-leading loudness, just Very Good by our calcs, but it may as well set the benchmark of how a smartphone stereo speakers should sound. Starting with the 2018 lineup Apple no longer includes a Lightning to 3.5mm audio adapter in the retail package of its iPhones, which means that we were unable to perform our audio quality test. We could have used an adapter from the iPhone X, but since the adapter contains a built-in DAC, the output would be representative of the adapter rather than the new iPhone XS. Active adapters such as this one do their own processing, so if you get a different adapter, you won’t get the same kind of output and our findings wouldn’t be relevant to you. Still, if you plan on purchasing the official Apple adapter, you will get the exact same output as with the iPhone X. You can find how it did over here.